BEGINNING WITH THE FRENCH explorer Jules d’Urville Dumont in the 1830s, geographers have grouped the far-flung islands of the PACIFIC OCEAN into three great island worlds: Melanesia, MICRONESIA, and POLYNESIA. Melanesia, derived from the Greek words for “black” and “islands,” consists of those islands that extend from New Guinea in the northwest to the FIJI Islands in the southeast. This distance is approximately 3,500 mi (5,600 km). 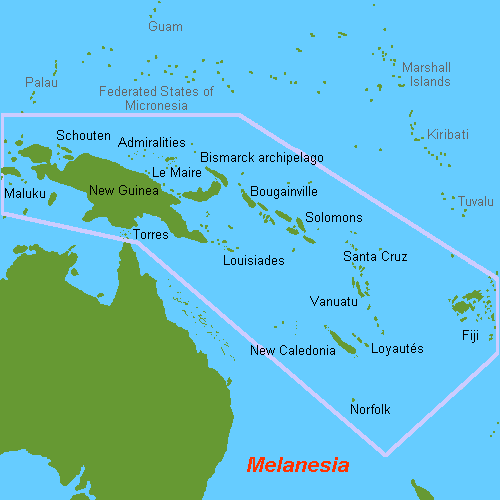 Melanesia includes, besides the large island of New Guinea, at least seven major island chains: the Admiralty Islands, the Bismarck Archipelago, the SOLOMON ISLANDS, the Santa Cruz Islands, the New Hebrides (now VANUATU), New Caledonia and nearby islands, and the Fiji Islands. New Guinea was first settled by sea from Southeast Asia, perhaps as long ago as 40,000 years, and the practice of agriculture was under way in New Guinea by 9,000 years ago, one of the earliest dates for agriculture known in the world. The indigenous Melanesian peoples are all dark-skinned—hence the name “Melanesia”—and all practice agriculture with an emphasis on root and tree crops (taro, yams, sweet potatoes, coconut, and sago palms) and pig husbandry. Settlements are small, although villages of up to 1,000 people exist in some areas, for example, in New Guinea’s Sepik River Valley. Melanesia is still largely dependent on subsistence agriculture and most of the people live in rural areas. The largest city of today’s Melanesia is Port Moresby, the capital of PAPUA NEW GUINEA. Port Moresby’s population is approximately 300,000. Melanesian societies, though small and sometimes widely spaced, were not isolated. TRADE ROUTES, very often emphasizing trade in ceremonial objects, were very common. An example is the famous trade system described by anthropologist Bronislaw Malinowski. This “Kula” trade linked the various settlements of the Trobriand Islands near New Guinea into a single economic unit. Indigenous Melanesian peoples speak languages that can be grouped into two main divisions. Languages of the Austronesian or Malayo-Polynesian language family are spoken along the coast of northern and eastern New Guinea and also in the island groups east to Fiji. So-called Papuan languages (not a language family but a grouping of non-Austronesian languages that may or may not be related) are spoken in interior and southern New Guinea and in the Bismarck Archipelago. Late in the 19th century, Melanesia was absorbed into the colonial empires of the NETHERLANDS, Great Britain, GERMANY, and FRANCE. In many cases, one European power would establish a colony only to prevent a rival colonial power from doing the same. The Netherlands absorbed the western half of New Guinea as part of the Dutch East Indies, now INDONESIA. Great Britain and later Australia colonized southeastern New Guinea. Great Britain also absorbed the southern Solomon Islands and the Santa Cruz and Fiji Islands. Germany, succeeded by Australia after World War I, colonized northeastern New Guinea, the Bismarck Archipelago, the Admiralty Islands, and the northern Solomon Islands including Bougainville. France took over New Caledonia and nearby islands, and, in a rather strange arrangement, administered the New Hebrides as a joint colonial possession with Great Britain. New Guinea was thus divided among three colonial powers; the Solomon Islands were divided in two. In 1970, Fiji was the first Melanesian nation to achieve independence. Politically, Melanesia is now divided into the Indonesian province of Papua, formerly called Irian Jaya (population about 1.8 million); independent Papua New Guinea (population about 5.4 million); the independent Solomon Islands (population about 523,000); independent Vanuatu, formerly the New Hebrides (population about 203,000); the independent Republic of Fiji (population about 881,000); and the French Overseas Territory of New Caledonia (population about 214,000). The total population of Melanesia today is thus about 9 million people, approximately 60 percent living in Papua New Guinea.